Microsoft announced recently that it will be shuttering HealthVault Insights, the company’s app-based research project that used machine learning to help users analyze and access their personal health records. The app will be removed from the iOS, Android, and Windows storefronts before the end of the month, although users will still be able to access a summary of their generated data on the HealthVault website, according to a blog post announcing the decision. However, more detailed data collected through the service will no longer be available to view. Launched in early 2017 as part of Microsoft’s Healthcare NExT initiative, HealthVault Insights hoped to improve care plan adherence and patient engagement. The app-based service augmented patients’ medical record through data collected via Apple Health and Google Fit services and delivered guided trend analytics to users and providers. The service also allowed providers to create and distribute customized care plans to their patients, who would receive alert notifications to increase engagement. In a blog post published on May 10, 2017, Microsoft wrote that feedback to HealthVault Insights “has been inspiring,” and noted “especially positive and energized” engagement related to the app’s action plans framework. In the same post, the company announced integration with Validic to bring support to additional devices, and a collaboration with Get Real Health to integrate FHIR support. Microsoft did not give any concrete insight behind its decision to ax HealthVault Insights in its most recent communication. Perhaps tellingly, the free app had mixed average review scores across the digital storefronts, ranging from a 3.5 out of 5 and 35 reviews on the Microsoft store, to a 2.2 out of 5 and only five reviews on the iOS store. First established in 2007, Microsoft’s HealthVault has long offered consumers and businesses a platform to record and share electronic health data. 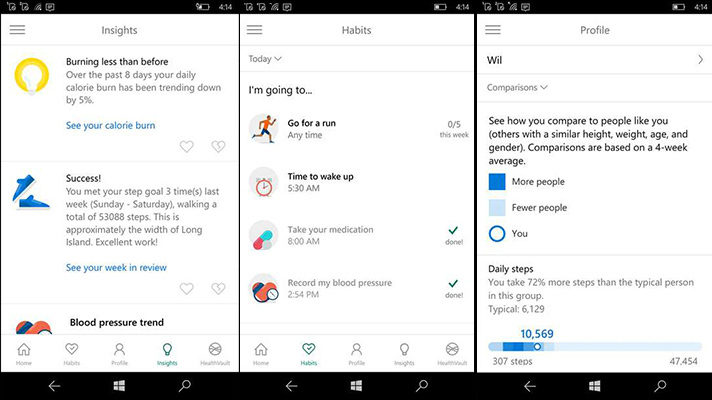 A representative for Microsoft's healthcare efforts told MobiHealthNews that the decision to close Insights will have no impact on the functionality of the HealthVault platform. This representative did not comment further on why the company decided to end the Insights project. Microsoft had a separate digital health playmaking headlines today as well when pictures of a canned Xbox Watch were posted on Twitter. Images of the device in action appear to confirm rumors that Microsoft was working on a smartwatch with heart rate monitoring, GPS tracking, and a dedicated workout app roughly half a decade ago. This device would have preceded the Microsoft Band, a fitness-focused smartwatch whose second iteration was discontinued in 2016.